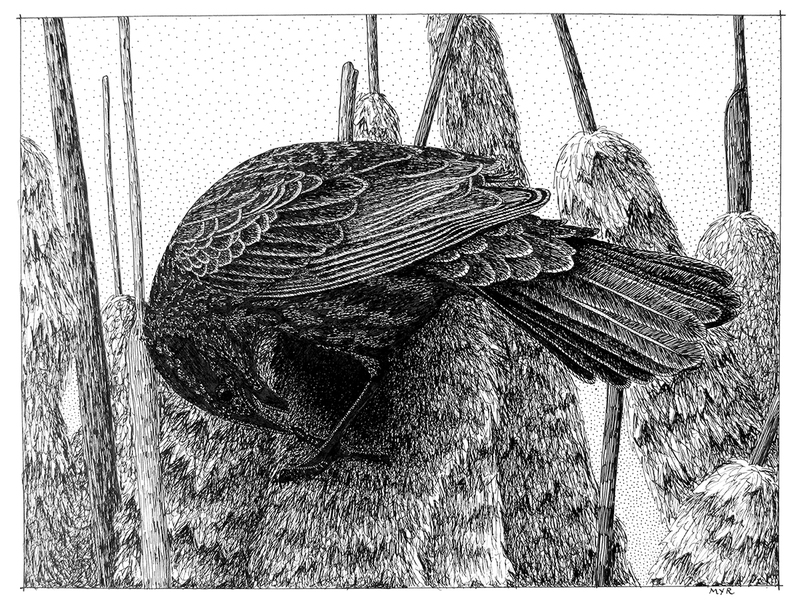 This pen and ink drawing of a female Red-winged Blackbird snacking on a cattail was initially meant to be a doodlewash for May 2016’s #DoodlewashDinner. But I drew it on very smooth paper which I soon realized was not watercolour friendly. I did draw a new bird drawing this weekend, my first act of drawing since last July. But I haven’t finished it yet, so it may show up as next month’s bird drawing. Miss RWBB is from a photograph I took. From May until July, RWBBs are the most numerous birds at the Alberta Children’s Hospital pond (not the actual name of the pond, but it has no name and the children’s hospital is the closest conspicuous human structure). 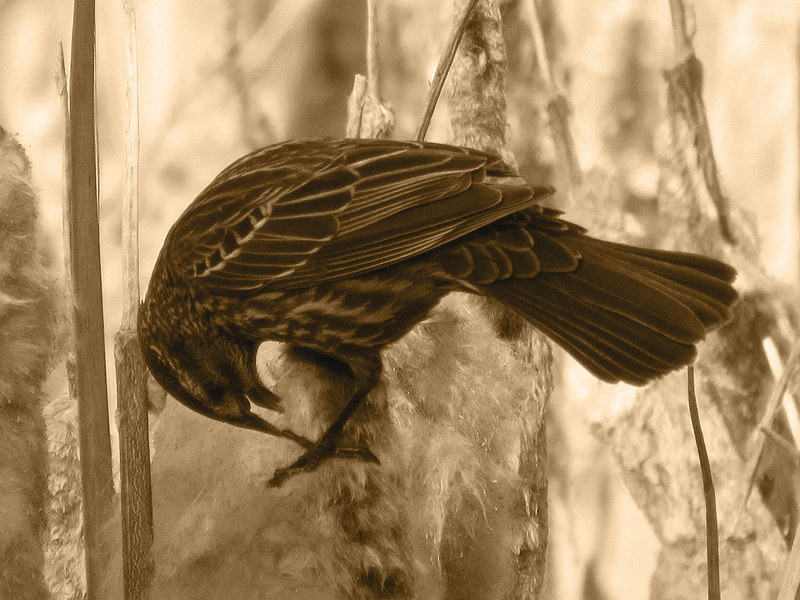 Female blackbirds do sing occasionally, but nowhere near as often as the males. About 40 males come to this pond in the spring to reproduce and their polyphonic calls fill the air around the pond during daylight hours. WOW! The details, and intricacy are amazing! It must have taken you hours and hours to complete this. Thanks for your lovely words, Deborah! 🙂 I worked on the drawing for a few weeks – an hour or two, here and there. Gorgeous Myra! Happy new year! Thanks, Jodi! 🙂 Happy New Year! Happy New Year to you too Myriam 🎉 Loved the detail work and style too! Thanks for your lovely comments and good wishes, Snehal! 🙂 And thanks for posting such an awesome series of bird paintings this month. So cool! Thanks for your lovely compliments, Kerfe! 🙂 I really appreciate the one about the background, since I find backgrounds harder to draw than foregrounds. 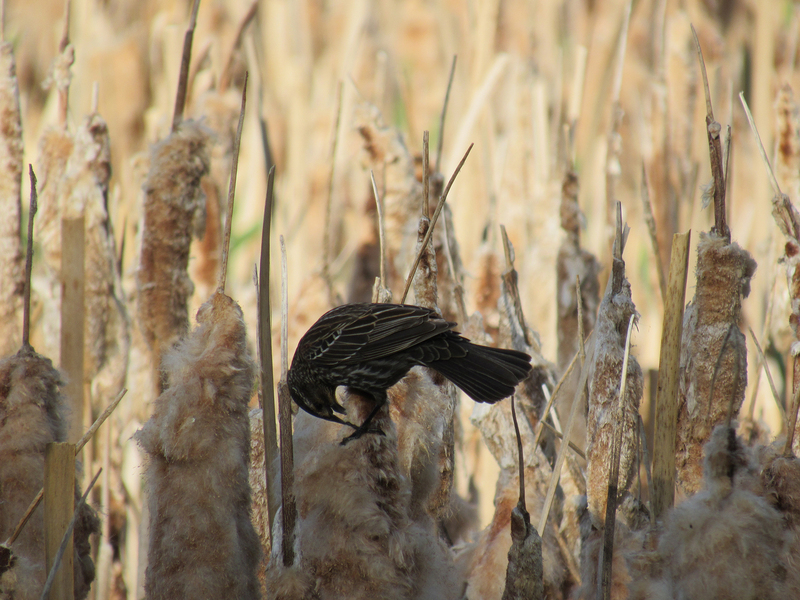 I’ve only ever seen these birds near cattails (ponds, lakes or slow moving streams), and they build their nests with cattails, among the cattails. I don’t know if there are populations that do things differently though. Lovely drawing, Myriam. RWBBs just love those cattails, and you captured that so beautifully here, I love that she’s bending so extensively into the cattail, like they do. I’m sure that made the drawing much more challenging. We are so lucky to have the presence of RWBBs in our world, singing and clicking and parading about — thank you for that reminder in your drawing. Thanks for your beautiful words, Jet :-). I’m so glad you enjoyed the drawing. And I’m glad you enjoy the RWBBs “singing and clicking and parading”! They put on such a delightful show! I’m looking forward to their return in April. I suppose they are year-round residents where you live? Thanks so much, Sherry :-)! Awesome!! Wonderful work, Myriam. A treat for sore eyes on a grey morning. Thanks for your lovely comment, Dina :-)! I’m so glad my drawing brightened up your morning! Absolutely gorgeous rendering Myriam! Thanks for following my website as well. I don’t often follow other sites but I made yours an exception. The quality, the nature theme and the sketching/pen and ink are faves of mine. I look forward to seeing all your work. Thanks so much for your lovely compliment, Terry :-)! Your colour pencil work is phenomenal! May I ask what kind of paper you like using for colour pencils? I bought some good colour pencils a year ago but I’ve only used them with sketchbook paper so far. Hi Miriam – I use mostly Strathmore Bristol Vellum and Stonehenge. For my techniques, I find they have just the right amount of tooth to apply many layers. This drawing is absolutely wonderful!!! Well done. You are so talented. Your work is stunning! Thank you so much! 🙂 I still have a lot to learn – about birds, pens and cattails! Wow, that last one is very well done. Thanks for sharing this. I like detailed ink work. Thank you! 🙂 Your love of detailed ink work is evident in your mandalas – the intricate, repeated patterns are wonderful and the angles and arrangements are new and unexpected to me. Thanks for sharing your art!